All of our websites are fully responsive, which means that they adjust their layout to the size of the screen, enabling desktop and mobile users alike to have the best experience possible. Our custom sites are built to load quickly and perform exceptionally in search engine results. Here are some of our most recent projects. 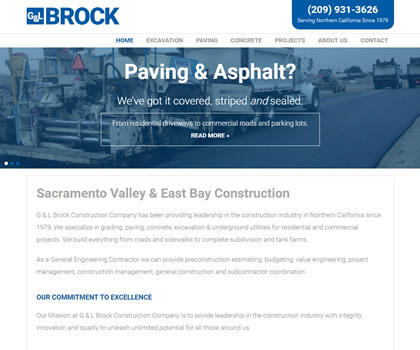 Brock Construction Co., Inc. has been recognized as a leader in the construction industry in Northern California since 1979. Despite this, until recently, they lacked a website. We provided them with a simple but effective custom design that accurately represents their brand. 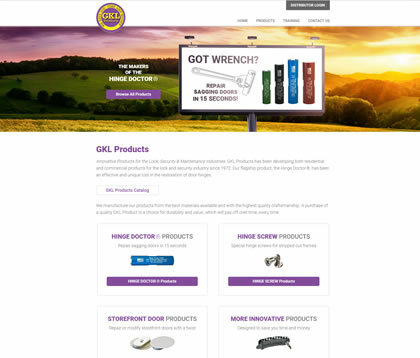 GKL Products has been developing both residential and commercial products for the lock and security industry since 1972. This project included everything from product images and catalog design to secure online ordering for distributors. This is what we love...connecting the right people. 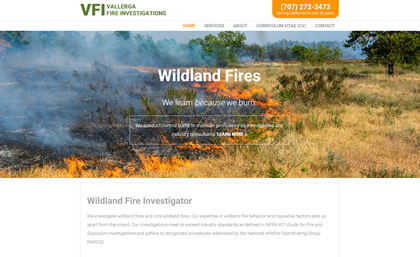 As this website steadily climbs up the ranks in search results, Vallerga Fire Investigations can now be easily found and is able assist others in preventing wildland fires and protecting California's natural resources. 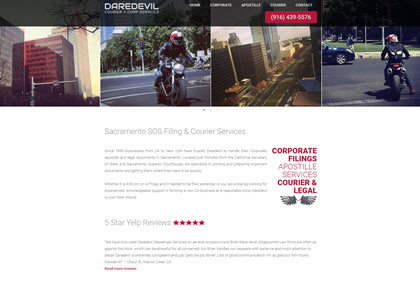 Daredevil Courier already had the 5 star Yelp reviews. 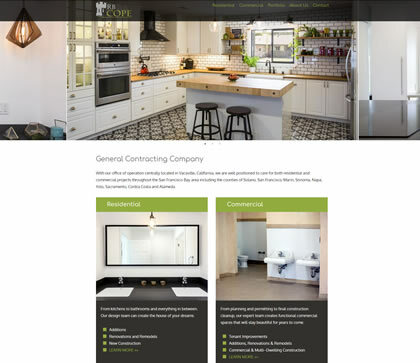 This website project enhanced their online presence by providing a clear picture of the company, including information on rates and services. Founded in 2010, RB Cope Contractors Inc. is a residential and commercial construction company serving the Bay Area. 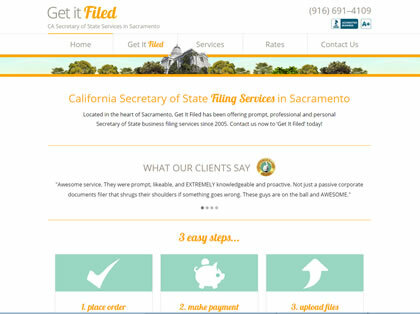 The goal of this website was to highlight services provided and to showcases recent projects. 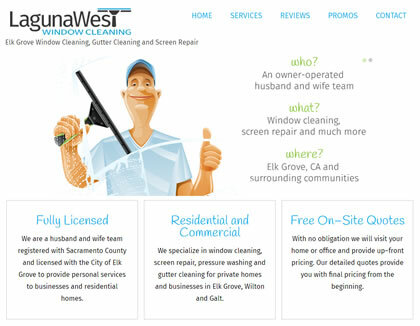 In addition to a new website, Laguna West Window Cleaning, an Elk Grove based company, upgraded to an advanced SEO package. We incorporated a number of proven SEO techniques, including everything from the initial search engine optimization (meta tags, indexing & quality page content) to generating legitimate external backlinks. They report that their investment in this project was fully covered within two months from the resulting internet based sales. This project included creating a custom responsive website for a local author, S. Lea who had very little technical know how. We assisted her with a full range of services including content writing, graphic design, book cover design, flyer design, hosted shopping cart setup and integration and logo design. We look forward to working with her in the future as she completes new books. 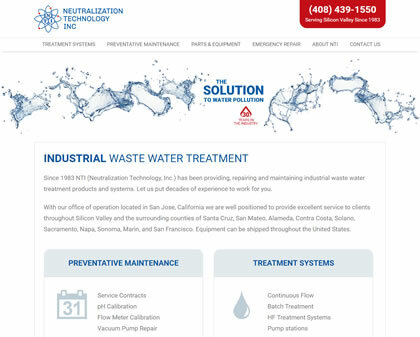 Since 1983 NTI (Neutralization Technology, Inc.) has been providing, repairing and maintaining industrial waste water treatment products and systems in Northern California. Despite having an excellent reputation in the industry and being well known within certain circles, they lacked an online presence. 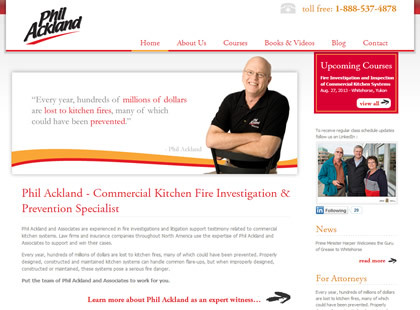 This project included creating a custom responsive website for them from the ground up. We look forward to working with them further in the near future on phase two of this project, adding a shopping cart. 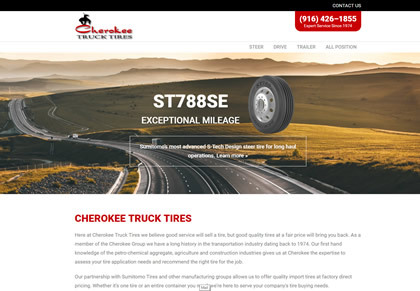 Cherokee Truck Tires, a division of Cherokee Hay and Grain, is an expanding Sacramento based business. In addition to providing an online catalog for their products, they can now be easily found online by both new and existing customers. 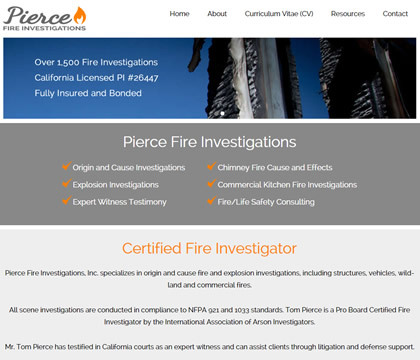 Pierce Fire Investigations based out of Bakersfield, CA wanted a professional and modern website. This fully responsive website is easy to read and navigate whether by computer, tablet or mobile device. 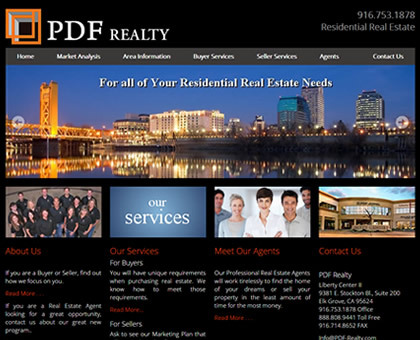 PDF Realty, the residential arm of PDF USA group of companies, is a recognizable and trusted brand in Sacramento and surrounding areas. They came to us with website maintenance concerns and a need for added functionality to their existing website. We quickly resolved their maintence concerns and developed an agent module that allows their agents to manage their own property listings. Despite enjoying a solid base of loyal clientel and an excellent reputation in the industry built on outstanding customer service, Get It Filed was falling behind the competition in terms of search ranking and web based new lead generation. They were frustrated as new startups quickly surpased them in search ranking. We recommended a complete re-design and re-brand to streamline and update the look and flow of the website. At last report, their search ranking is steadily improving. Manny Carillo, CEO of Carillo Handrail systems and inventor of the patented Safety Anchor Post System approached us with a dilema. He had invested a lot of time and resources in the development of an excellent product and was working hard to promote it, but often found himself at the same road-block, potential buyers asking, "Where is your website?" He asked us for help developing a website and brand that would appropriately represent his product. 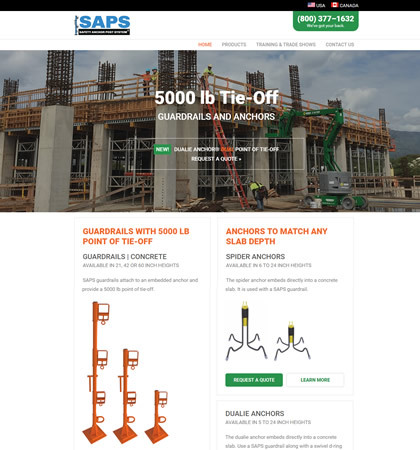 After the completion of this project Manny published the following comments, "Samuel and his team, have overcome marketing challenges for my company in an expedite fashion...Solutions that work for the client...web design, brochures and a company logo. Thank You." The power of social media greatly depends on choosing the right social media platform for your business. In addition to providing maintenance for Phil Ackland and Associates' existing WordPress website, we also help them to harness the power of LinkedIn to market their courses throughout Canada and the United States. In recent years, more products and services have become available online and consumers have become more comfortable shopping on the internet. As a result, many businesses have seen the advantage of having an ecommerce shopping cart. 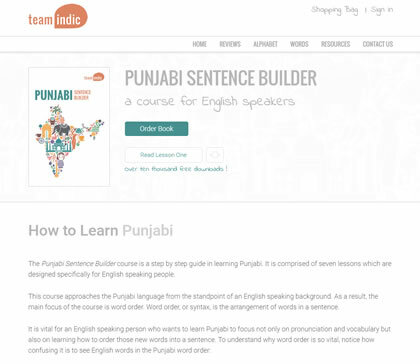 Our latest project for How to Learn Punjabi now allows them to make their language courses available for online purchase. This project also included an interactive blog and forum for posting information and promoting online discussions.